What is an Action Item? Action Item is a task which is assigned to a specific individual generally with an end date. Action items are typically a result of discussions between various parties in a meeting. An action item can also arise from a situation such as incidents or emergency within the organization. Actions are used effectively in Project Management and Day-to-day operations (BAU). During the meeting or discussion when an action item is discovered ensure that you write it down the details. Ensure that you capture the name of the person who will work on the action item with a commitment for an end date. As soon as the meeting is complete and you go back to your desk send an email to all the attendees of the meeting with actions items and dates. Without delays capture the actions in the action items register with adequate details like name, due date, priority, and progress. Review the pending actions items regularly on a weekly basis. Send reminders for any key tasks as people generally forget. Always start the meeting with follow up on previous action items. Clearly highlight delayed tasks or any dependencies. In case of the responsible person not responding copy the manager or escalate to the manager. Rolling actions items is a concept in which action items are maintained and regularly visited until they are closed. The critical thing with keeping actions rolling items is to move the closed items to a different list and review the open items regularly. Reviewing the action items periodically ensures that the tasks are tracked, and there is a better chance of things getting completed on time. Our action item template is built so that it can be used to monitor rolling actions items. Raise request with the network team to establish connectivity with the vendor systems. Test the connectivity with the vendor systems. Prepare API Documentation and User Manual with step by step guidelines. Prepare release notes and circulate. Release to the Production environment. Send out Go Live communication. Update the latest customer quote for Mr. Zan. Update API Code to include an emergency fix. Confirm environmental availability for the production release. Obtain API documentation from Visa, Mastercard. Get connectivity details for the development. Arrange for detailed steps for customer on-boarding. Majority of the action items arise from meetings. Because meetings involve multiple people generally discussion about an issue or general update there are always tasks that come from a meeting. Typically, action items are created to address some roadblocks or routine tasks. It can be very challenging for the person running the meeting to host the meeting and also document the action items. Actions for meetings are captured within the Minutes of Meetings (MOM or just Minutes). The MOM contains other information about what happened in the meeting including the actions. Action items are recorded as a table with the description, due date, and assignee. 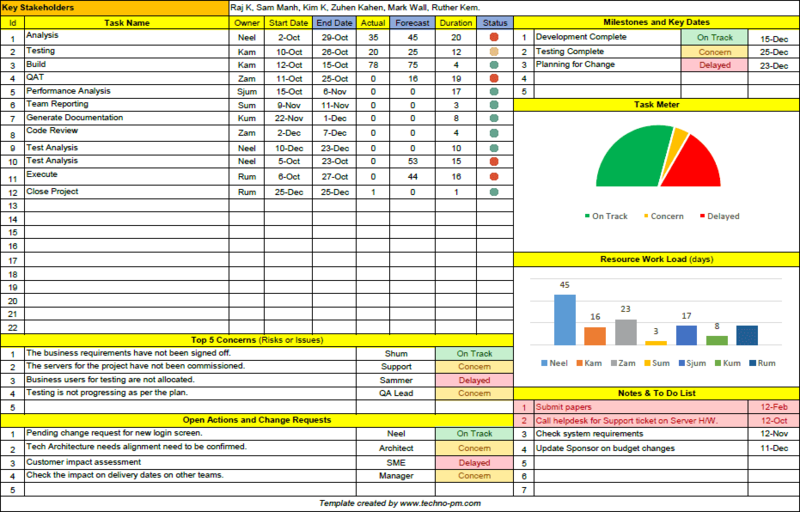 See our Capture Meeting Actions with our 4 Minutes of Meeting Templates to start capturing actions from meetings. Revisit all the actions items for the previous meeting. It is a good idea to write down the actions as typing can take longer. If possible, you can ask for some help from someone else in the meeting to take notes. At the end of the meeting confirm the actions items with the people responsible. Without fail send the actions items immediately after the meeting. Send a reminder a week before so that people come prepared to the meeting. 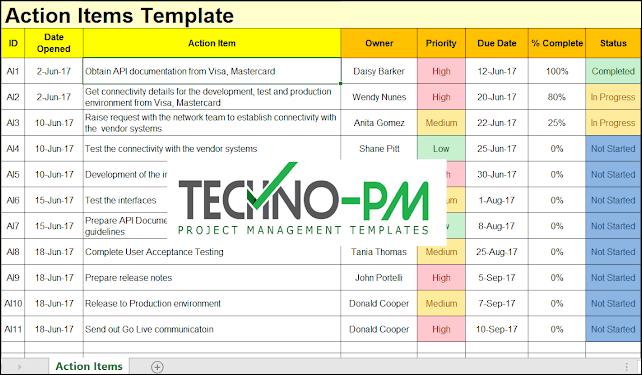 Using action items to get tasks done is a common practice in project management. A project manager interacts with a host of people when managing projects. Examples of which are different people on the project team, stakeholders, vendors, external parties or other project managers. 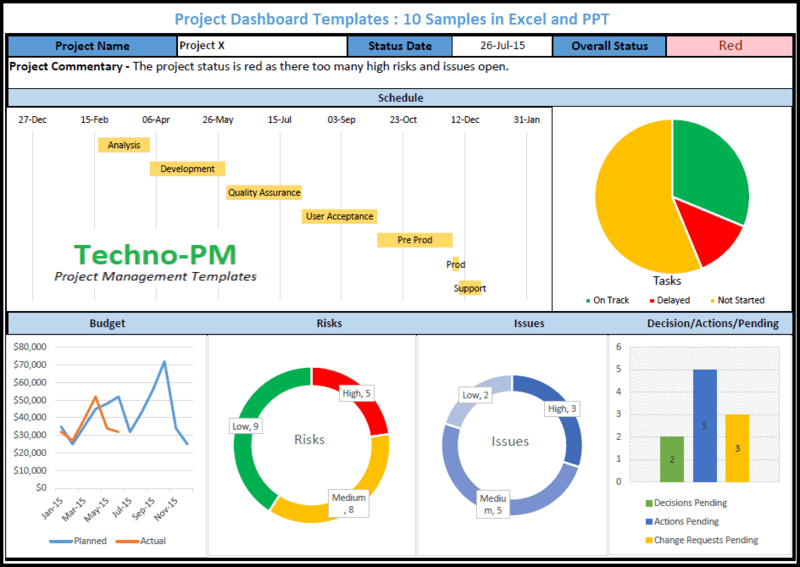 The action item that a project manager captures is focused on the particular project being managed. Actions that arise during daily stand-up or catch-up meetings. 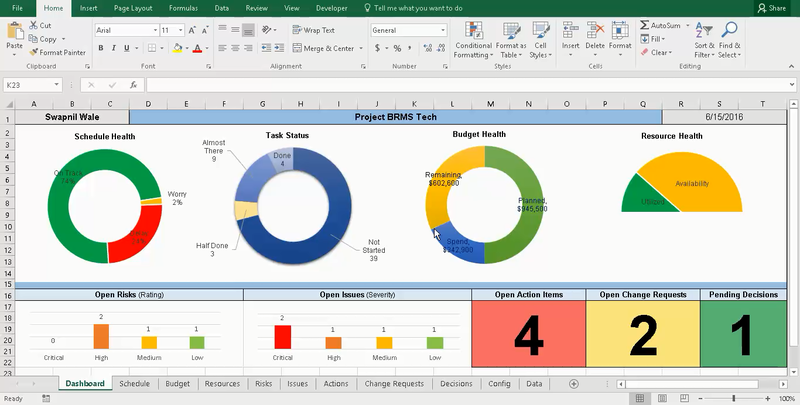 Tasks that created a result of project control board meetings. Meetings with external parties or vendors. Specific requests that are coming from stakeholders or senior management. One of the effective ways of communicating open actions items is using emails. 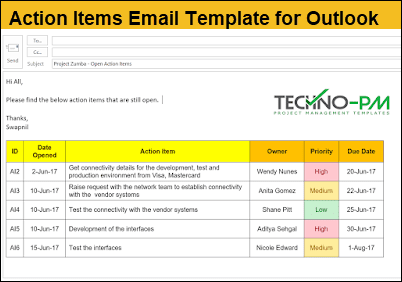 Using our email templates, you can easily let the responsible people know what their actions are. It is essential that you have the actions clearly defined in the email body so that people can immediately see it. If you attach as a document, it is good, but it will not guarantee that people will look at the actions. Your goal is to get the actions done in time so that project or task can progress. ID: This serves as a unique identifier for an action item and is used for reference of a particular item in a tracker. Once a task is assigned a number, it should not be changed. Action Item: An action item is a task that is assigned to an individual and needs to be completed within the defined timelines. E.g. : Obtain approval on the billing agreement prior to the commencement of the services to the client. In this example, the service provider requires to complete this action item before they start providing services to the client. Owner: Every action item is assigned to a project member who “owns” the task and is accountable and responsible for the closure of the item. Priority: The level of priority denotes the importance of the action item and this helps define the items which need to be resolved with the highest precedence. This field has 3 values - “High” indicates High Priority; “Medium” indicates Medium Priority and “Low” indicates Low Priority. 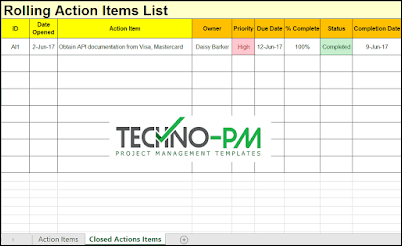 % Complete: An action item has a due date for completion and this field denotes the percentage completion of the item until the due date. This will help to identify if the action item will be completed as per the agreed timelines. Comments/Notes: A brief description of the current status in terms of what progress has been made on the action item is noted here starting with the date and the most recent update on the top. The action item template for word is very simple and can be prepared in a very short time. The template contains 3 very basic information about action items. The description for an action item, the owner and a due date. You can highlight the delayed action items by highlighting in red color.